Factory style replacement Seat Covers. Manufactured in U.S.A. to factory specifications and workmanship. Available in your choice of Original MBZ Pebble Leather or Original MB-Tex Pebble Vinyl, 100% fit guarantee and includes 5 year warranty. 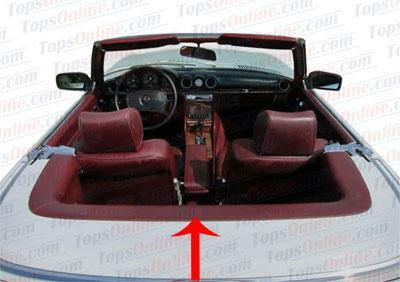 Seat Covers fit both Left hand & Right hand drive models. For 1980 450SL & 280SL models please go to 1980 thru 1985 page. This set of replacement Seat Covers is hand crafted for the Mercedes Benz 280SL, 350SL & 450SL models (Body style 107), and fits the 1972, 1973, 1974, 1975, 1976, 1977, 1978 and 1979 model years. Fits 1972 thru 1979 SL Convertible models. 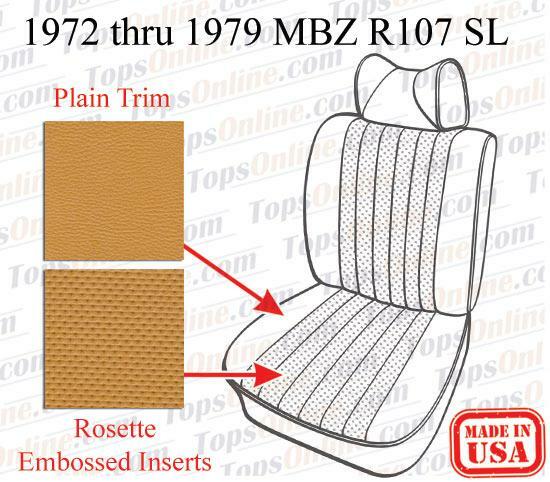 Vinyl Seat Covers are made with original Mercedes MB-Tex Pebble textured Vinyl and Rosette embossed MB-Tex Vinyl inserts. Leather Seat Covers are made with original Mercedes Pebble textured Leather and Rosette embossed Mercedes Leather inserts. Other colors & custom made 2 tone covers can be made, please inquire. Front Covers kit includes, 2 front Cushion covers, 2 front Backrest covers, 2 front Headrest covers & 1 front Center arm rest cover. 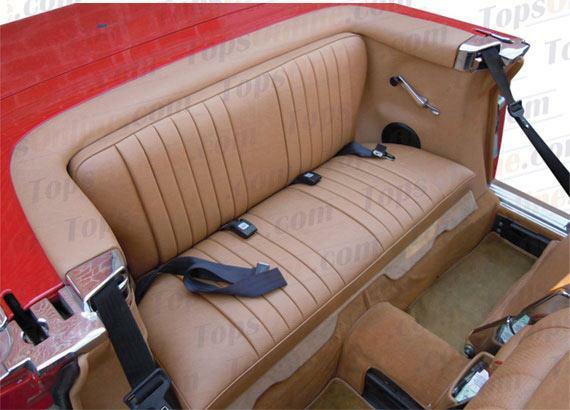 Backrest Back Panel Cover is, Matching Leather or Vinyl to recover the 2 front seat backrest back panels. If your existing back panel covers are in good shape, you can re-use them. Factory style Rubberized Horsehair Seat Pads, made to factory specifications & quality. 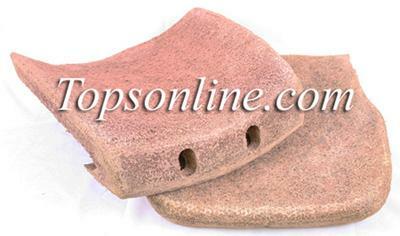 Left and Right side pads are the same shape and size and are interchangeable. 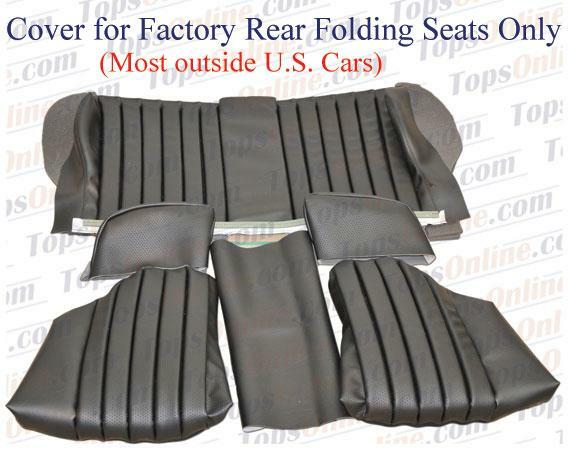 Important: Replacement Rear seat covers will only fit Factory original folding rear seats with zippered cushions, mostly non U.S. market cars that came with rear seat from Mercedes Benz. Will not fit aftermarket models that were made by various aftermarket seat manufacturing companies. Rear seat cover kit includes all required Vinyl or Leather pieces & rear seat backrest back carpet piece for complete rear seat restoration. Vinyl Seats are made with original Mercedes MB-Tex Pebble textured Vinyl and Rosette embossed Mercedes MB-Tex Vinyl inserts. Leather Seats are made with original Mercedes Pebble textured Leather and Rosette embossed Mercedes Leather inserts. Complete Rear Jump Seat Assembly, includes 2 easy install Lap Belts. Made with high quality high density Foam rubber. Vinyl Seats are made with original Mercedes MB-Tex Pebble textured Vinyl and Rosette embossed Mercedes MB-Tex Vinyl inserts. Leather Seats are made with original Mercedes Pebble textured Leather and Rosette embossed Mercedes Leather inserts. Other colors & custom made 2 tone covers can be made, please inquire. Door panels sold as a pair (Left & Right sides). Di-Electrically Heat Sealed as Original; made with original MB-Tex Pebble textured Vinyl & MB-Tex Rosette embossed Vinyl inserts. Front Covers includes Left & Right side door panel covers to recover existing door panel boards & matching material to recover door panel pockets. Front & Quarter Covers includes Left & Right side door panel covers to recover existing door panel boards, matching material to recover door panel pockets & additional matching material to recover rear quarter panels. Door Panel Kit includes Left & Right side door panel covers, Left & Right side Door panel Masonite boards, matching material to recover door panel pockets & additional matching material to recover rear quarter panels. Door Boards includes Left & Right side front Door panel Masonite boards only (no covers or matching materials).